Custom Bobble heads FAQ's. These should help you find the additional information you require - if you can't find the answer to your question, don't hesitate to contact us. Is it possible for you to do ...? How long must I wait for my bobbleheads? My add-ons are pretty specific, How much will it cost? Do I get a discount on shipping if I purchase multiple bobbleheads? I am looking for more than one unit of my custom bobblehead - can I get a discount? Stages of Proofs and are you still Not Sure? Satisfaction and likeness of my bobblehead problems. Yes, If you can imagine it, we can make it. Just give us your detail comments and photos, we can sculpt anything as long as you can imagine. see our fully comstomized section. Also for the Past Sample Bodies, We can change the clothing colors, remove/add extra item such as sunglasses and hats. You have the shipping option on order page to select the time frame to receive your item. 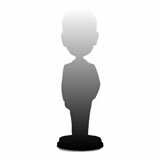 if you need to receive the bobblehead fast, We can make and deliver it within 5 days. We ship all our bobblehead dolls via DHL, you may get the doll in 2-4days after ship. We send photos to you during production for approval, If any delays in receipt of approval of the proof or changes to the proof are requested, additional time may be needed to complete the job. Our single bobblehead dolls start at $79 and generally cost between $89-$109, including standard delivery. A few of the more intricate dolls (custom-body doll, car, motorcycle, pet) are more expensive. We charge small additional fees of $3-$7 for add-on items like tattoos, glasses and hats. Free, Any small add-ons not listing on our website are free, you can write your specific on the comment. Yes, we will offer a discount on shipping for combine shipments. Yes, we offer quantity discounts. Please email us for a quote and let us know how many copies you will need. The discount level will increase with the quantity ordered. Generally, we need just 2 good quality and clear photographs of the individual needed to be sculpted on the bobblehead – 1 front-view and 1 side-view. The output of the bobblehead depends on the quality of the photograph. Therefore, we always recommend that the photograph should have a smiling face or with some unique facial expression. We strongly advise against sending us wedding photos or artistic photos that use soft lenses, but lack in facial details. We accept all picture formats but prefer .JPG and .GIF files. However, should you want a head to toe full custom design, we will need a body shot or body position or pose photo. WORLDWIDE! We ship products all Over the World – to well over 210 Worldwide destinations. YES! After your order has been shipped, we will send you an email shipping notice, confirming that your package has been sent to you. The email will also provide you with a Tracking Number. Sculpted Head - we will hand sculpt the head to resemble the primary photo you attached to the order. At this time, you will be able to make any changes to the facial properties, nose, mouth, etc(Does not include the skin and hair color). Changes are done if necessary at no charge to you. Once you approve the item we continue to the next phase. Once approved, The head will be baked and no further changes to the face can be made. Body Proof (if applies) - we will hand sculpt the body to resemble the order notes and or photo you attached to the order. At this time, you will be able to make any changes to the position, etc. Changes are done if necessary at no charge to you. Once you approve the item we continue to the next phase. Once approved, The body will be baked and no further changes to the body can be made. the skin and hair color, we choose the color of the clay for your doll based on the selected color, we have to remake the product if any changes after we do so, and that will be subject to a fee. Make sure you choose your colors as you want them. Complete proof (if applies) - during this stage, we will show you the finished product, during this phase and with all your previous feedback, most customers are happy and approve their doll to have it shipped. At this stage, only the logos can be changed as your doll is completely baked and can not be changed. We have to re-sculpt the head/body if you want to make any other changes at this stage, and we will charge $25 USD to re-sculpt a head/body. 100% satisfaction guarantee. Proofs will be email to you for approval by each step. You can provide your opinion when reviewing the proofs, our sculptors will take your comment seriously and make the amendment the way you asked. By doing this, you can ensure the likeness of the bobblehead that you are receiving.